When reading the newspaper, listening to politicians or discussing current events, how can you determine whether the facts and opinions shared are truthful and accurate or misleading and false? 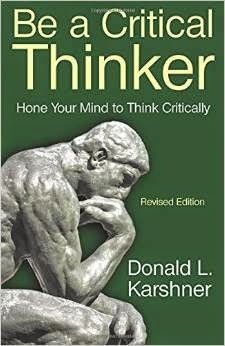 Donald L. Karshner has had a lifelong interest in developing critical thinking skills. Inspired by his granddaughter, who was open to suggestions as she went off to college, Karshner began compiling his advice on honing critical thinking. This book evolved from the few pages he had written for his granddaughter. Be a Critical Thinker offers a clear process for applying critical thinking skills to scrutinize ideas, facts and interpretations, even when they are inconsistent or contradictory. By applying the skills of critical thinking, you will be better equipped to clarify your thinking process, to intelligently critique what you read and hear, to correct errors, to dispel misunderstandings and ignorance, and to make a positive contribution to a discussion or debate.